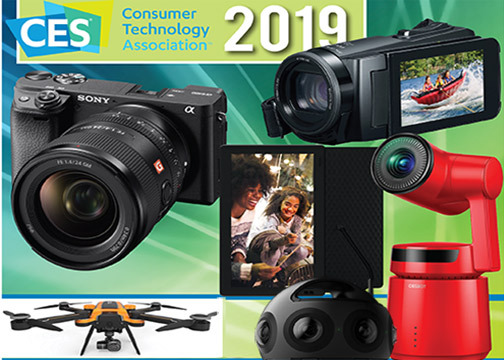 At CES 2019, more than 180,000 attendees saw the high-tech products and services being offered by some 4,500 companies from around the world, including 1,200 start-ups. The big CE show was held in Las Vegas, Nevada, January 8–11, 2019. Consumer electronics accounted for $330 billion in sales in the U.S. last year. There were some fears before the show that the Trump-administration-imposed tariffs and its trade threats would have a negative impact on the consumer electronics industry, which is dependent on a global supply chain. And that, in turn, would have a negative impact on CES. However, that wasn’t the case. All the numbers indicate the continued strength of consumer electronics. And that includes the number of attendees, the number of participating companies, and especially the number of companies at the show that are just entering the tech sector. That number is up by 200 from 2018. Moreover, there were an estimated 15,000 different products on display. Well-represented categories were audio visual, virtual and augmented reality, robotics, artificial intelligence, personal and home security, wellness and fitness, drones and autonomous vehicles. Autonomous vehicles in particular got a lot of buzz. This wasn’t the first time they were represented, but now they are more of a real product than a concept. There were models from small utility vehicles and personal automobiles to larger public transport systems. It’s obvious that developments in self-navigating vehicles are coming faster than industry insiders expected. Capabilities that were predicted in 2018 to come along in three to five years are already incorporated into current designs. And a lot of those developments, like safety and navigation, are migrating to conventional vehicles. There was also an autonomous flying machine. Bell, one of the leading helicopter companies, showed a prototype model of its Nexus. The five-seat flying system utilizes six rotors to stay airborne. It operates somewhat like a Marine Corps Osprey, taking off and landing vertically like a helicopter, then flying like a fixed-wing aircraft. 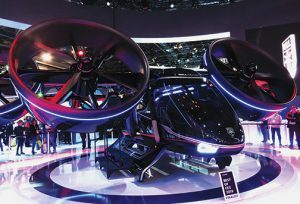 When it becomes operational in 2020, one of its expected uses will be to serve as an air taxi. Conventional drones were another strong category. The selection of products is growing rapidly: with new sizes, configurations and capabilities. This is apparently the year of the big drones. Hoversurf showed the first drone-type flying machine in operation that’s can carry a person. The four-rotor Hoverbike S3 is in use by the Dubai police department. I had the opportunity to get on board; it felt like having a big, very big, Harley under me. More testing and certifications are required before the S3 can become available for commercial use in the U.S. At a cost of $150,000, it’s a little pricey. However, prices are expected to drop rapidly as units go into production and migrate stateside. Until recently, drones were simply aerial imaging platforms. They had an embedded or attached camera for taking stills or videos, which was pretty much all they could do. But increasingly, unmanned aerial vehicles (UAVs) are becoming productivity platforms that go beyond imaging capabilities. Several companies exhibited modular drone systems with multiple camera options and other capabilities. GDU released the Saga. In addition to carrying cameras, it’s capable of carrying a megaphone, a floodlight and other items. It has several camera options: a 4K video camera; an infrared camera; and cameras with 10x and 30x zoom capabilities. The latter really sets the Saga apart. Moreover, the Saga takes incredibly close-up images of distant objects with very limited shake or distortion. To ensure smooth operation, the camera is mounted on a special three-axis stabilization unit. The stability of the footage demonstrated was excellent, all the way through the zoom range, from slightly wide angle to extreme telephoto. 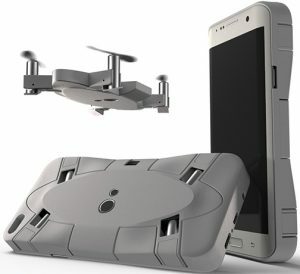 The drone sells for $3,000; the 30x camera costs $4,200. Another interesting model is the AEE Selfly. It’s an extremely small unit that doubles as a cell phone case, so it is always available. The unit folds down to a thin 10mm and attaches to the back of the phone. Controlled by a Wi-Fi app, its tiny built-in camera captures both video and stills. Range and altitude are limited, but the Selfly is fun to fly and makes it possible to get an aerial perspective whenever you want. The mini drone-phone case will retail for $99 when it becomes available later in the year. Virtual reality (VR) continues to be big, and along with it augmented reality and 3D. 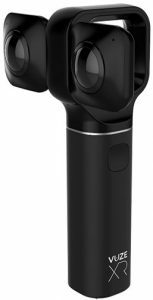 Insta360 displayed the Titan, a 360º horizontal/vertical VR camera. It comes with eight 200º f/3.2 lenses, each in front of a Micro Four Thirds sensor. The sensors are the largest available in any stand-alone VR camera, maximizing image quality, dynamic range, color depth and low-light capabilities. 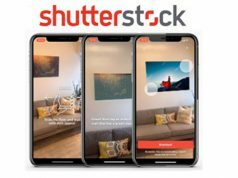 Real-time stitching produces 10,560×5,280 11K 2D images or 10,560×10,560 11K 3D still images, as well as 11K 2D and 10K 3D video. Frame rates go up to 120 fps at a video resolution of 5,280×2640. Moreover, it captures audio with four microphones. The Titan costs $15,000. Insta360 also showed its One X 360º action camera. 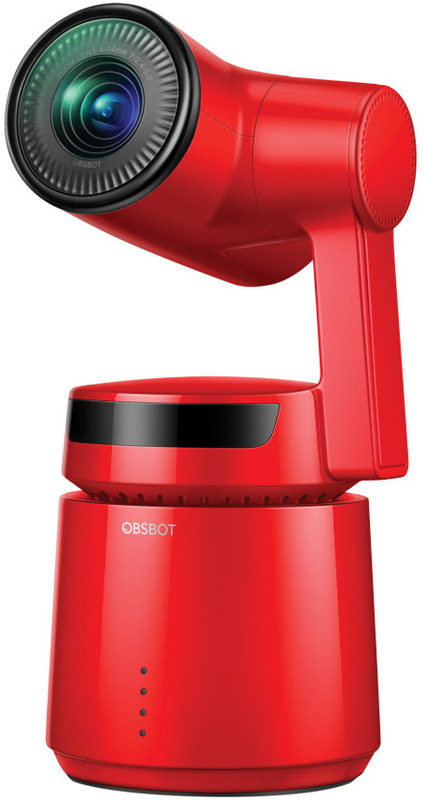 Priced at $400, it has a 5,760×2,880 max resolution and takes 3,008×1,504 video at up to 100 fps. It also captures 18MP stills. What makes the One X interesting is how the company suggests it can be used: just throwing it at, under or over whatever you want to capture. Its 360º coverage guarantees something will be captured. Vuze debuted another innovative model: the Humaneyes Vuze XR Dual VR 5.7K camera. 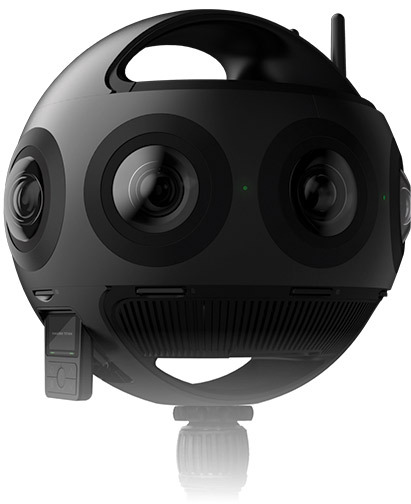 It shoots 360ºx180º fully spherical VR as well as 180ºx180º half spherical 3D video. It also captures 18MP photos. At 5.7K, the maximum frame rate is 30 per second. It jumps to 60 fps at the lower 4K resolution. It also comes with four MEMS 48 Hz microphones. Two cameras, each with a Sony 12MP sensor, are mounted on its battery pack handle. Furthermore, the two small cameras are configurable back to back or side by side. The back to back configuration captures 360º VR footage; the side by side records 180º stereoscopic video or still images. It’s priced at $439. Remo’s Obsbot Tail camera is another noteworthy introduction. Billed as the world’s first auto-director AI camera, the Tail tracks and captures one’s movement automatically, even in complicated environments. That makes it possible for users to be their own actor, director and cameraman. Advanced AI tracking technology ensures stable tracking and the ability to regain lost targets quickly. Also, a gesture control function based on extensive deep learning is integrated into the camera. As a result, users can customize gestures to trigger certain control functions. The Tail uses a professional lens systems and a Sony CMOS sensor to capture 4K video at 60 fps as well as 12MP images. Another unique feature is the built-in 3-axis 360º lock-free gimbal that makes it simple to shoot smooth, professional-looking, cinematic footage without a camera operator. Remo will set the release date and cost when the Tail enters its Kickstarter campaign this month. Another tracking device previewed at the show is the Pivo, an interactive pod for smartphones, or GoPro cameras with an adapter. It features 12 advanced smart capture modes, like face following, object tracking, concurrent multi live streaming, time-lapse shooting and panorama photography. It’s priced at $70 during its Kickstarter phase and is expected to cost $140 afterwards. Eastman Kodak popularized photography with the introduction of roll film and the Brownie camera in 1900. The Brownie’s dollar price tag made it possible for nearly anybody to afford photography. 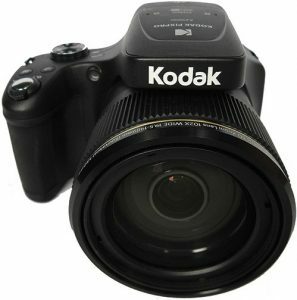 Kodak also played a major role in the film to digital transition in the late 1980s and early ’90s by introducing the first DSLRs, which were based on Nikon and Canon bodies. So it was nice to see the Kodak brand on two camera lines at CES. The new Smile instant print cameras and printer are sold by Eastman Kodak. A range of 360º VR cameras and point-and-shoots models are distributed by JK Imaging. Both had a strong presence. 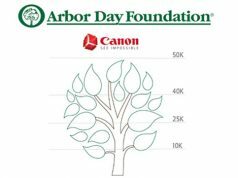 The offerings range from miniature pocket models like the Kodak PixPro FZ43 Friendly Zoom to sophisticated cameras like the PixPro AZ1000 Astro Zoom. At 102x, the AZ1000 has one of the longest telephoto ultrazoom lenses on the market. Combined with digital zoom, coverage extends to 408x, or 8000mm (equivalent). It shoots at a (35mm) wide angle of 19.5mm and captures 20MP photos in JPEG or RAW format. It also records 4K 30p video. 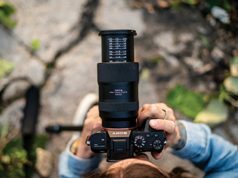 Nikon acknowledged the importance of serious video capabilities to its customer base with the Nikon Z 6 Filmmaker’s Kit. For content creators looking to utilize the mirrorless Z 6’s advanced video capabilities, the kit provides vital video capture accessories. 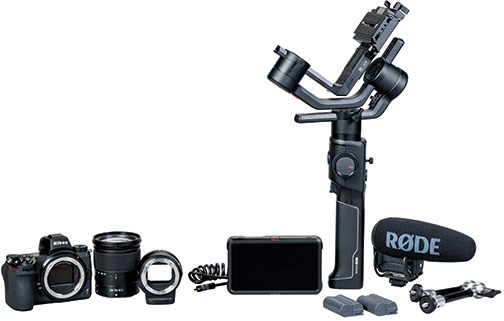 It includes: a Nikon Z 6; a Nikkor Z 24–70mm f/4 S lens; the Mount Adapter FTZ; the Atomos Ninja V 4K HDR 5-inch monitor recorder; a Rode VideoMic Pro Plus; a MOZA Air 2 3-axis handheld gimbal stabilizer; an additional EN-EL15b battery; a coiled HDMI cable; a 12-month Vimeo Pro membership; and a complimentary Nikon School online class. 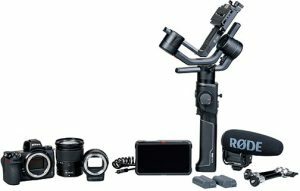 The Nikon Z 6 Filmmaker’s Kit retails for $3,999.95. Quite frankly, CES can be overwhelming. There are just so many things to see in its four-day run that it’s impossible to get more than a simple taste of technology. But it’s a taste that leaves you wanting more. We will have to wait for CES 2020, scheduled for January 7–10, in Las Vegas.